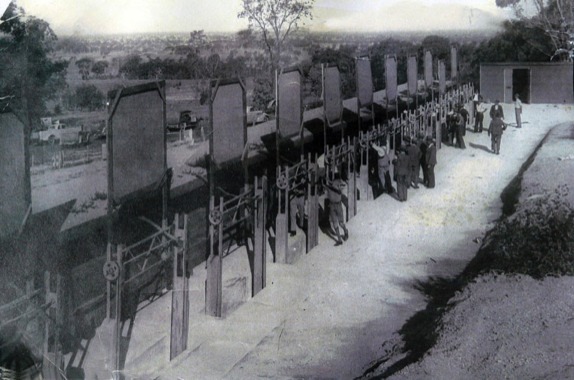 The South Wangaratta Rifle Range was situated on Emslie’s farm at South Wangaratta until 1955. The “Argus”, Monday 10th March 1941 reported that the new Rifle Range, at the foot of the Warby Range, at South Wangaratta was officially opened on 8th March 1941. It was built at a cost of £2000 and the opening was performed by Cr. A.H. Smith. When war broke out rifle clubs closed and the weapons were collected by the Government. Rifle club members were encouraged to join the army. The 58th Battalion wanted a weapons’ training facility in Wangaratta, and, so the Warby Range site was selected. The entry was off Gravel Pit Road in South Wangaratta. The range was 900 yards long with shooting mounds, butts, backstops and a storage shed. It ran parallel to the Warby Ranges. The Army managed and used the range between 1941 and 1945. All weapons in training were used and, at times, the training included the use of Bren Gun Carriers. Projectiles were found, in later years, embedded in firewood. The Army even used the facility for night time weapons, training. From 1951 to 1955 the range was also used by National Servicemen during their Corps training, with the 9/14 Prince of Wales Rifles and the 8/13 Victorian Mounted Rifles. A recommendation by the RSL to the Government saw the formation of a Volunteer Defence Corps (VDC). Their role was to guard home installations and support the army in case of invasion. The members were fully equipped and trained by mobile army personnel. The Wangaratta unit of the VDC had three country platoons, Milawa, Eldorado and South Wangaratta. The South Wangaratta group were mainly local citrus farmers and their base was the rifle range. Their training included the use of trench mortars, machine guns, Bren and Owen guns , rifles and hand grenades. VDC training exercises, in defence of Wangaratta, were held in the form of mock battles. One such exercise was in February 1942, when the 59th Battalion returned to Wangaratta from Seymour to take part in manoeuvres and to engage the “enemy forces” as they headed inland towards Wangaratta. The countryside was blacked out, wireless communication established with urgent responses to messages of sabotage and at nightfall VDC members patrolled the streets. This “Battle of Wangaratta” was a huge success with the enemy convincingly defeated. 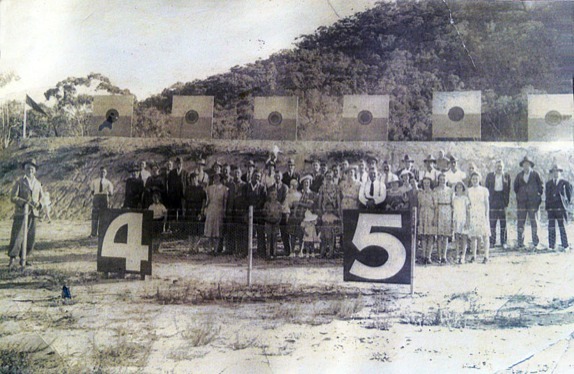 After the war in 1945 the rifle club reformed and resumed their activities at the range. The annual “Easter King Shoot” was a popular event. In 1955 the Wangaratta rifle club moved to Glenrowan.